This site has been written and created by Anne Wright of Tallahassee Florida. From a very early age, Anne's ambition was to own horses. So that she would be prepared, Anne studied horses and their care from when she could first read. Anne was given her first horse at the age of thirteen and trained her second and third horses for riding before she graduated from high school. After graduating from college, she started a American Quarter Horse breeding farm outside of Tallahassee. In 1982, Anne began also boarding horses for other people and narrowed her breeding operation to breeding for dun and buckskin color Quarter Horses. Many of the horses in the pictures on these pages were bred and raised by Anne. As part of her boarding business, Anne came in contact with many new horse owners who knew little about horse care. In the interests of both horses and owners, Anne began her "Off the Hoof Horsemanship" course which she taught as a non-credit course though the Center for Participant Education at Florida State University. After retiring from the boarding business, Anne became an avid computer user and decided that a web site based on the course would be a wonderful idea. And so grew this web site! Above: Some of Anne's horses in past years. The horse whose view we see is Milagro's Smoky Glitz or "Ziggy", a grulla Quarter Horse mare. 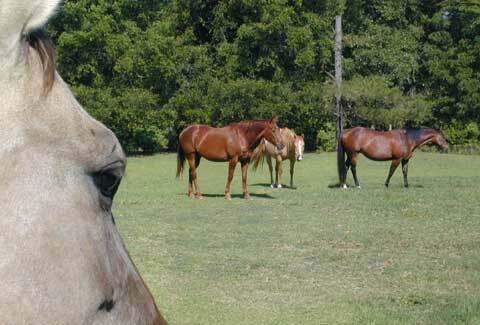 The three horses in her view are from left to right, Madame Caan, Certs, and Dude's Last Valentine. Certs was Ziggy's dam. Valentine is Ziggy's grandam. These three mares are the dams of the three colts shown in the header on these pages. From left to right the colts are Milagro Sun (Certs), Jimmy Milagro Caan (Madame Caan), and Milagro's Smoky Dude (Dude's Last Valentine). All three colts were by Anne Wright's stallion, Smoky Milagro, that she bred and raised. At the time of the photograph, the colts were not quite a year old. The third colt, Milagro's Smoky Dude, is Ziggy's sire. He now stands at stud in Swan Valley, Idaho.